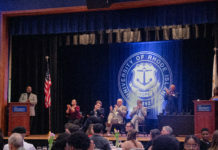 The University of Rhode Island will be breaking ground on a new $5 million visitors center this coming June, which will remain under construction for roughly a year. The new visitor center will offer prospective students and their families more amenities than the current ‘hut’ that stands in its place, according to Project Manager Mark Fisher. Fisher believes that the new visitors center will be more efficient and self-contained. Instead of sending visitors out to multiple locations on campus, like the Memorial Union where campus tours leave from, the new visitors center will offer a generous seating area, restrooms and coffee stations, as well as two presentation rooms. “When people get there after driving a couple of hours, or three hours or four hours, they’ll actually have a place they come and relax and sit down for a bit,” Fisher said. Senior communicative disorders major and Tour Guide Training Coordinator, Rebecca Bevacqua, said that the eventual end goal will be to offer campus tours out of the new visitors center once it’s completed. Sophomore civil engineering major student tour guide Kalvin Cho said it’s going to be a bit of a struggle for students to base tours out of the visitors center, since it is so far away from the rest of campus, but that they will make it work. Fisher said the estimated construction costs of $5 million will be paid through private operative costs of the university, unlike larger scale projects that rely mostly on state bonds. The project has not gone out to bid yet, but is currently under final review from the State Fire Marshall and the Building Official, according to Fisher. The project is anticipated to go out to bid within the next month. Construction is expected to begin June after graduation and commencement ceremonies, with completion estimated for June or July of 2018. In the meantime, all visitors center operations for the summer and upcoming academic year will be based out of the University Club on Upper College Road, according to Fisher. The new visitors center will remain a one-story structure, but will cover 11,000 square feet. Fisher said this sizable increase will create changes to the current parking lot, which will lose a few spaces. This was done mostly to protect the surrounding trees, which were planted in memory of students and faculty who lost their lives during World War I. Even though a few spaces will be lost, Fisher said that overall, the new parking situation will be much more efficient and convenient for visitors. Instead of having to receive a ticket from inside the visitor center, passes will be given out at the gate and validated inside. There will no longer be an entrance into the adjacent faculty, staff and visitor center parking lot on Upper College Road. All visitors will enter and exit from the gate on Briar Lane, according to Fisher.